K-State faculty and staff are the heart and soul of the university — in more ways than one. Not only do they shape the student experience at K-State, but they also invest in K-State’s future through the All-University Campaign for K-State. The All-University Campaign is just one way K-State faculty and staff members have a direct impact on the university’s goal of becoming a top 50 public research university by 2025. When K-State faculty and staff participate in the campaign annually, it sends a positive message of commitment to the friends, corporate partners and alumni who are willing to invest in our university. 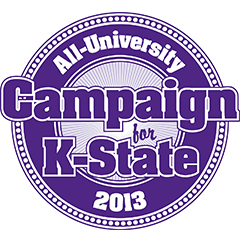 Learn more about the All-University Campaign for K-State.